Anyone have a clue on where to start with this? I agree with Graham Kemp's "skeleton for the proof". Rather than provide a skeleton, I will provide a completed proof but using a different proof checker. To make this work in the proof checker I renamed the statements. You may not be able to use all of the inference rules as they are used here. I used conjunction elimination (∧E), contradiction introduction (⊥I), explosion (X), conditional introduction (→I), and disjunction elimination (∨E). Klement's proof checker and information about the rules I used can be found in forall x referenced below. 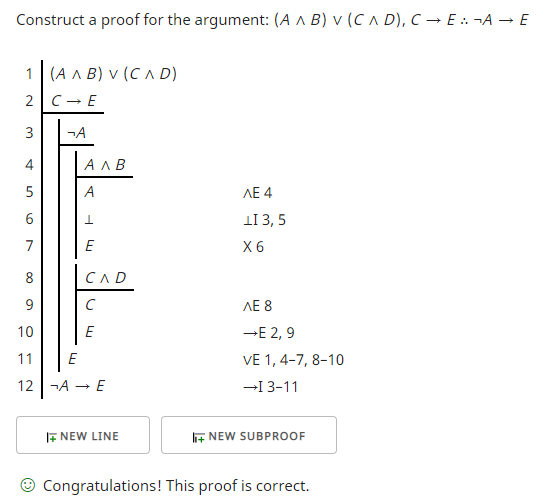 Clearly you want a Conditional Proof to prove that conditional. Assume ~Tet(a) aiming to derive Dodec(e). Now look at the to premises and the assumption and ask: how may I derive Dodec(e) from that disjunction, conditional, and negation?